I know first hand the value of a good book to keep motivated and inspired on the journey to good health. So every now and then I’ll recommend a piece of new reading material, whether it be a recipe book, life coaching book or fitness plan that has really helped me. This week I’m reviewing the Raw Foods Bible by Craig B. Summers. Raw food has gained a loyal following over the past few years, but back when this book was written (2006), it was more a marginal concept than a movement. 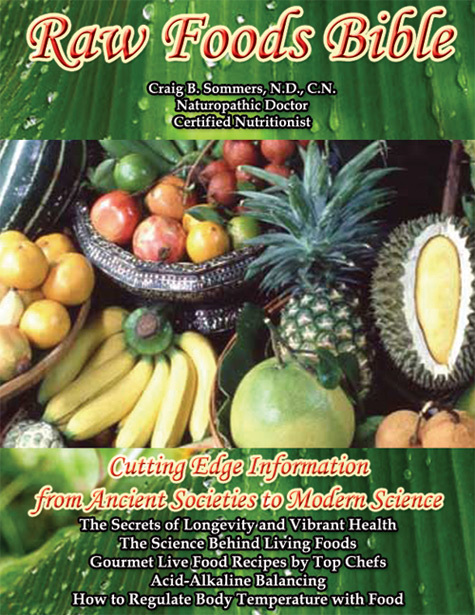 As you’ll read in these pages, eating raw has many health benefits – it helps cure illnesses and disease, aids memory and clear thought, and promotes restful sleep because your organs don’t have to work overtime to process all the heavy foods we normally eat. The times I’ve felt the healthiest in my life were times when I was eating raw, either as a prelude to a detox programme or just for respite or to give my immune system a boost. OK, I couldn’t do it forever (I’d definitely miss hot lentil soup, for one), but I do believe it’s good to integrate this way of eating into your diet as much as possible to maximise nutrition and ease your system. The last time I went raw I only needed four hours sleep a night, and I was remembering dreams I had when I was a child, my mind was that clear. That’s a Prime Minister’s eating plan, if ever there was. So whenever you next need a sharp memory, and you don’t have much time for rest, I’d say give this book a whirl and get chopping those veg. And with dozens of interesting recipes to try, this book proves that eating raw needn’t be a chore.